where did you get that bed floor? I put the seat belts in, seats and console. Still need to install the shifter boot, door weather strips, door sills and the radio speaker. Nice work! Any tips for trimming holes in the carpet? I've always just hacked away as meticulously as possible but there must be a better technique. I recently had to re-glue (3M weatherstrip adhesive) a portion of a door weatherstrip and used several large metal paper clip/clamps to hold the glued section in place - worked well. No good tips on cutting holes in the carpet just a good razor blade and a sharp knife, cut an X where you want the hole. Alot of holes I went under the truck and poke a all up through the carpet. I had to feel for a lot of the holes and poke a hole with a all. I need to get motivated and get back out there to do my weatherstrips,and shifter boot. When I did my carpet in the suburban, I used an old soldering iron. I sharpened the point a little, got it up to temp and poked it up through the floor where I could and down from the top for the remainder. It melted or I say 'cauterized' the holes for a nice, sealed edge. Very permanent, so make sure the carpet is in the right spot. I have done a few this way and it works pretty well. Just don't lay a hot soldering iron on your new carpet. One of the main uprights nearly finished.....got to drill some holes up the side of the vertical tube for adjusting up and down. 2. turn it upside down for easier access to work on the underside. I did my door weatherstrips today. I lifted the roof off enough to get at the top of the seals. It was rock solid no rust clean along the windshield frame. I cleaned everything up and installed my seals.When I was pulling the roof off the two front LT/RT hold down bolts broke off. I could not get them to easy out so I stepped drill the bolts out and ran a tap back though the nut plates. I put the roof back on and finished off the seals. I did not like the way the drip deflectors fit so I put the stock ones back on until I get it fiqured out. I got a few more things to do on the interior like the rear pnls, shifter boot, radio speaker. Got my Parkerized parts back today - here are some representative shots: hood hinge, pitman arm, 72 hooks, underside of a door striker plate, upper hood latch. The bolts are the unique 12-pointers used to attach the hood latch at the rad support. They come coated with a fine layer of gun oil. Those are so nice, I wish I had thought to do that when I had mine apart. Looks like a durable, no nonsense finish. Looks great. Who does that in Alb.? 72 Blazer, 70 El Camino SS, Anniversary HD FatBoy, 2012 Ram 3500 4WD Dually, 17 Dodge Challenger, 80 Vette, 65 Chevy 3/4 Ton 4 W/D Pickup and some more. Wife: 06 GMC Duramax 3500 4WD Single Wheel, 2016 BMW X3. Next: Rust removal on my Blazer. Thinking of putting a 50 Chevy cab on a 76 Chev 4 WD pickup. The local shop here in MT did a really good job. Man '67steven those knobs are bad a$$! Well it runs and stops now ! Time to get rid of the gas can......tonights project. Yuck !!!!! Those came out much darker than the stuff you showed me from down here. Nice man! 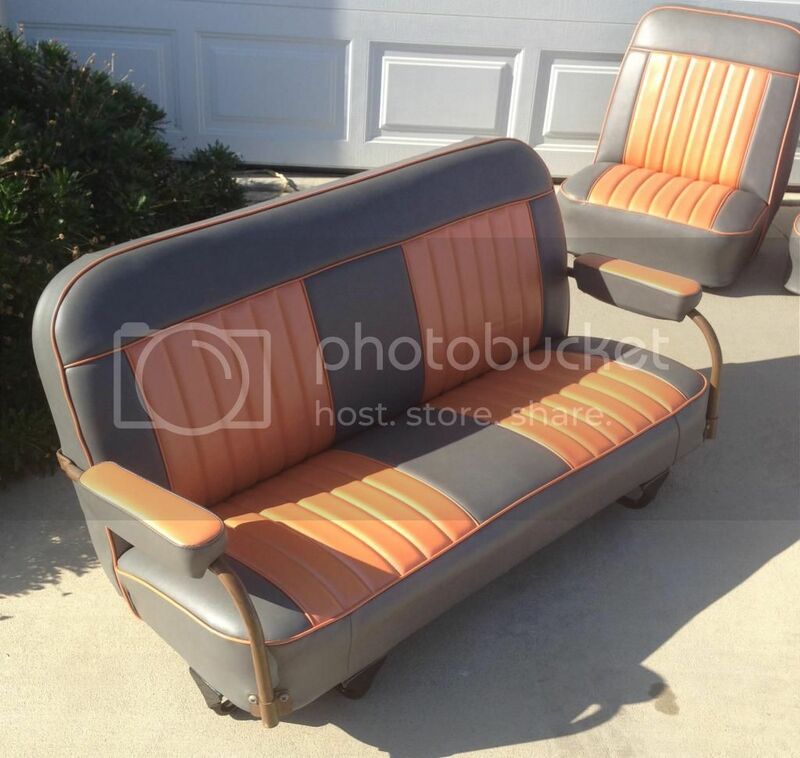 Well, I didn't really "Do" anything today, except pick these up from my local upholstery shop. 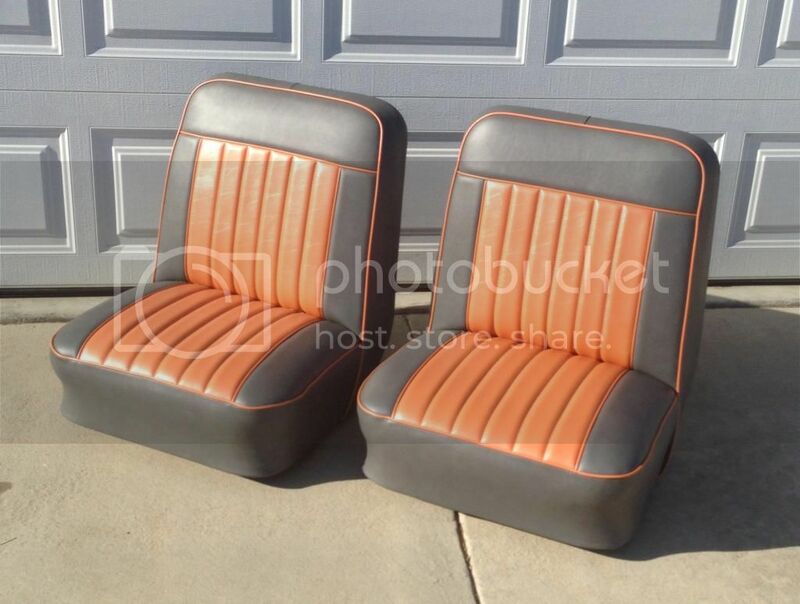 He did a great job with the Utility Buckets, and the rear seat. 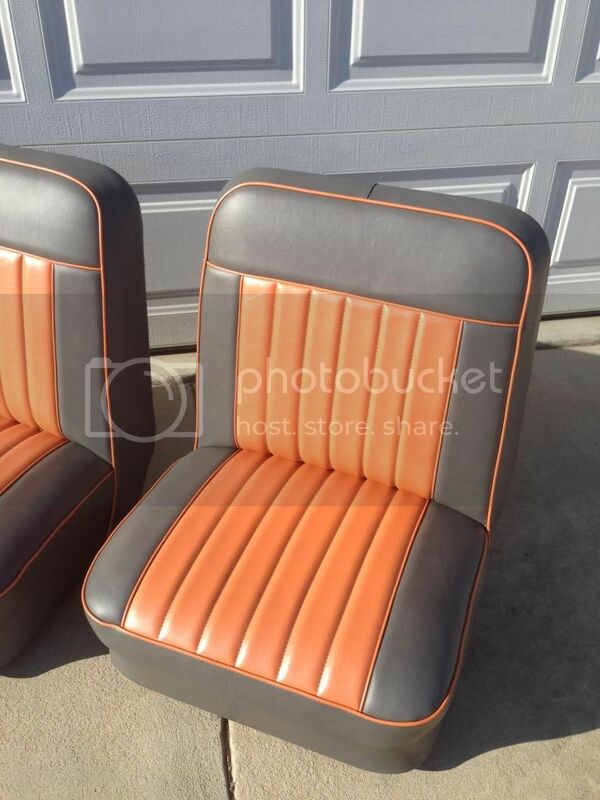 He also upholstered the armrests for the rear seat and filled in the ashtray locations. 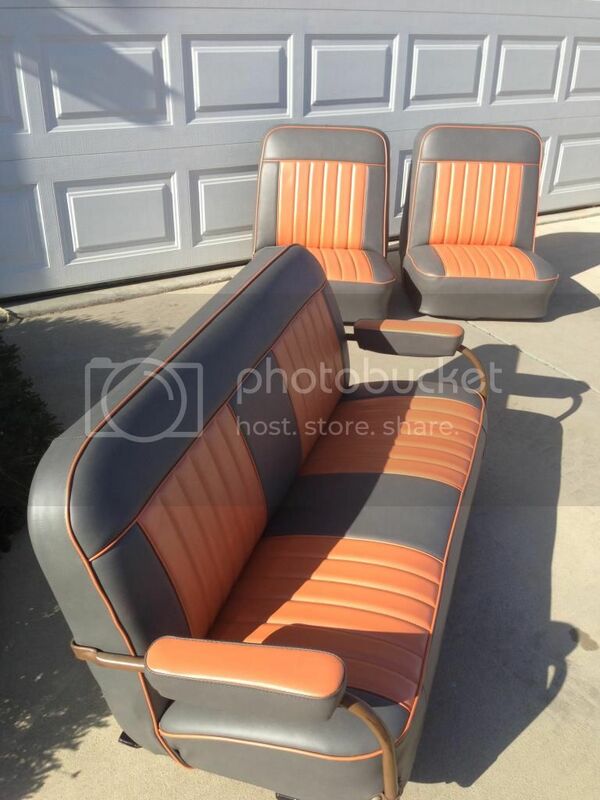 I just need to paint the rear seat arms, and the metal seat backs for the front seats, clean up and paint the seat tracks...then bolt them in (after I get done fixing my rusty floor, LOL)...It will be nice to finally have seats, since I bought this truck with no seats in it!